Discover the Grand Canyon at its deepest, widest and most impressive part on this guided Grand Canyon day tour from Las Vegas. Highlights include the Mojave Desert and an up close look at the Joshua Tree, a stop in historic Williams, AZ where the Grand Canyon Railway meets Route 66, incredible views of the Grand Canyon South Rim, and a made-to-order lunch. 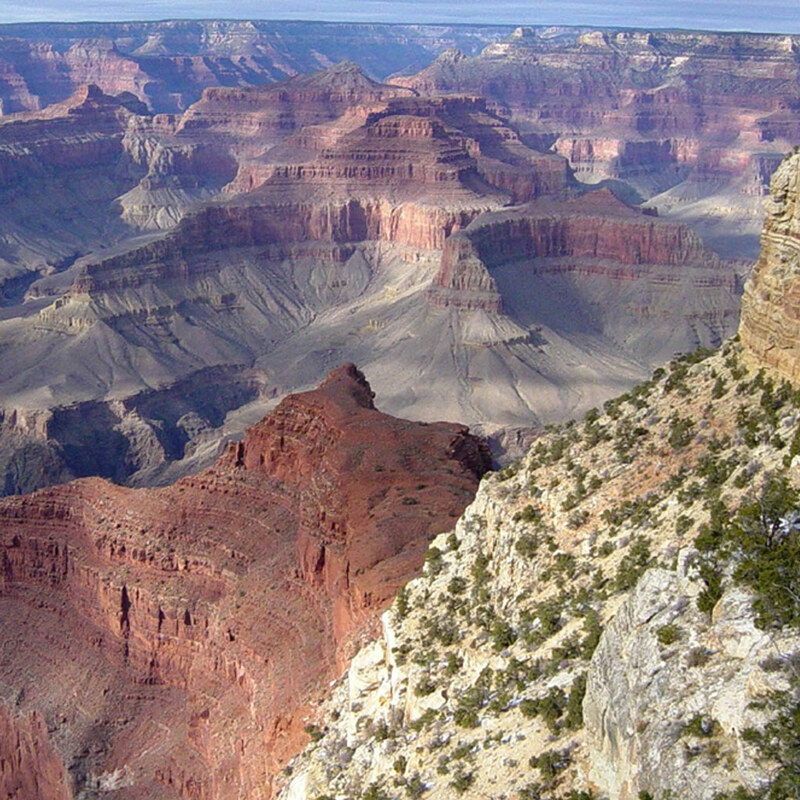 The Grand Canyon National Park day tour departs from Las Vegas at approximately 5:30am and returns at approximately 7:00pm. If one day isn’t enough, we invite you to experience sunset and sunrise at the Grand Canyon on our Grand Canyon Overnight Tour. DETOURS custom touring vehicles are specifically designed for small groups with comfortable, individual captain’s chairs. Tours canceled within 48 hours of departure will be charged in full. A minimum number of guests must be met for this tour. You may be booked on stand by until the tour is confirmed. This tour can also be operated as a private tour. Contact a tour specialist for details. Before arriving to the widest and deepest part of Grand Canyon National Park, the tour will stop in historic Williams, AZ. With the Grand Canyon Railway and the intersection of Route 66, this small town is a reminder of the American west from the 1950s. During your three hours in Grand Canyon National Park, you will have opportunities to walk along the rim, shop, capture an unlimited amount of photographs, or enjoy your lunch and relax with the best seat in the house. Your guide will ensure you get the best views from Mather Point, Yavapai Point or one of the many other beautiful viewpoints at the Canyon. Temperatures at Grand Canyon National Park vary by season. We recommend our guests bring jackets in the event of changing weather patterns. ADD-ON AN AMAZING HELICOPTER TOUR! The Southwest Escape is a Grand Canyon helicopter tour that departs from the South Rim of the Grand Canyon taking you over the beautiful Kaibab National Forest. Upon reaching the edge of the canyon, the South Rim gently drops away as the North Rim and eastern end of the canyon come into view – one of the most spectacular views in the entire canyon. In the distance, it is possible to see the Painted Desert and the Desert View Watchtower designed by the Hopi Indians. Your journey continues as you follow the Colorado River upstream to where it merges with the Little Colorado River. Visiting the Grand Canyon is a once-in-a-lifetime experience and I was extremely happy that I did it with Detours. The weather on the day we chose was not great (cloudy mainly) but our guide really made the difference in this day trip from Vegas. He was very professional, attentive and knowledgeable, a 5-Star tour guide! In addition to the spectacular Grand Canyon, the tour included another unmissable highlight if you travel to USA: the famous Route 66 with stop in one of its historic towns. I had a great day out, thanks Detours! Our tour to Grand Canyon South Rim with our tour guide was amazing. He gave us a lot of history and pointed out so many things during the drive to the Canyon including an Eagle's nest in a tree. We had enough time at the Canyon with plenty of stops on the way including some very cool stores. I would take this tour again and I will recommend it to friends and family. I am very happy that we chose Detours. It was a day that my family and I will always remember. Thank you Detours! These are all approximations, please check the weather prior to your tour. Winter temperatures at the Grand Canyon can range from 0-40 degrees fahrenheit. Spring and fall temperature range from 40-70 degrees fahrenheit. Summer temperatures range from 70-90 degrees fahrenheit. What is my pick up time? To give you the best experience, pick up times are at approximately 5:30am, but the specific time depends on your pick up location. We will contact you between 4-6pm the evening before the tour to confirm your exact pickup time. Do we make a stop at the Hoover Dam? No, that is only on the Grand Canyon West Rim tour since it is almost a 5 hour drive to the South Rim from Las Vegas. Will I be able to hike into the canyon? You’ll have a total of three (3) hours at the Canyon, but we highly recommend staying along the rim. The trails into the canyon can take over 4 hours to reach the bottom and take twice as long to come back out. Will we visit the Skywalk? No, the Skywalk is at the West Rim of the Grand Canyon. Our tour covers the South Rim only. What type of lunch is provided? We provide a boxed lunch with choices of different sub sandwiches and includes mayo/mustard, chips, and a cookie. The office staff will be in contact with you after you book your reservation and provide you with our meal options. The Grand Canyon is approximately 4.5 hours from the Las Vegas area. With stops made along the way though, we typically arrive around noon. How long do we spend at the Grand Canyon? We recommend closed-toed shoes year round. During the winter, we recommend layers, long pants, winter coats, gloves, and hats. During spring and fall, we recommend jackets. Tour the Apache Trail from Phoenix and experience the wonder of the Superstition Mountain Wilderness, Tortilla Flat, the Goldfield Ghost Town and the scenic Dolly Steamboat Cruise on Canyon Lake. Embark upon this tour of the Verde Valley, including Jerome and the Verde Canyon Railroad. From community gardens to olive mills, the Arizona Fresh Foodie Trail® Tour takes you on a guided journey of agritourism through Mesa, Queen Creek and Gilbert.